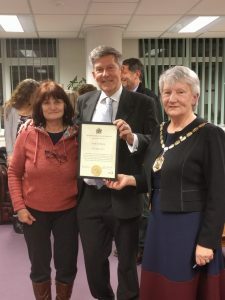 On 29 January 2019, at a reception in Merton Civic Centre, our Drop-in manager Andy Fairbairn received a certificate from the Mayor of Merton, Cllr. Mary Curtin, for his outstanding ten years service with Faith in Action Merton Homelessness Project. Photo: Andy with Linda Kirby, who was instrumental in establishing Faith in Action, and Cllr. Mary Curtin, Mayor of Merton.